In the midst of summer, the megalopolis of Tokyo with its 9 million-population and science fiction like landscape is a unique place for the photographer, mixing thousands of shot opportunities, with thousands of individuals and their personal stories. June 2015, single image, additional exposures for highlights and traffic trails, focal length 30mm, aperture f/11, shutter speed 6 seconds, ISO 100, tripod. Best shown in the movie “Lost in Translation”, Tokyo is heart to the biggest density of individuals working and travelling together each morning, while it is also often called “the Tokyo Desert”, an emotional phenomenon common in the megalopolis where loneliness can become overwhelming. Unusual encounters may start from the strangest way, and many stories are heard of lovers who met on their morning commute on the Yama-note metro line. Many Tokyoites take part in social activities such as dancing classes to overcome these lone feelings. By the time we reached our hotel in Tokyo, near Daimon metro station, not far from Tokyo’s bay, I decided to alter my original shooting plan. Instead of walking through the park to Tokyo Tower for a sunset session, I took advantage of the spectacular glowing lights already in place, adding an unexpected dramatic tension to the neon-lit streetscapes. 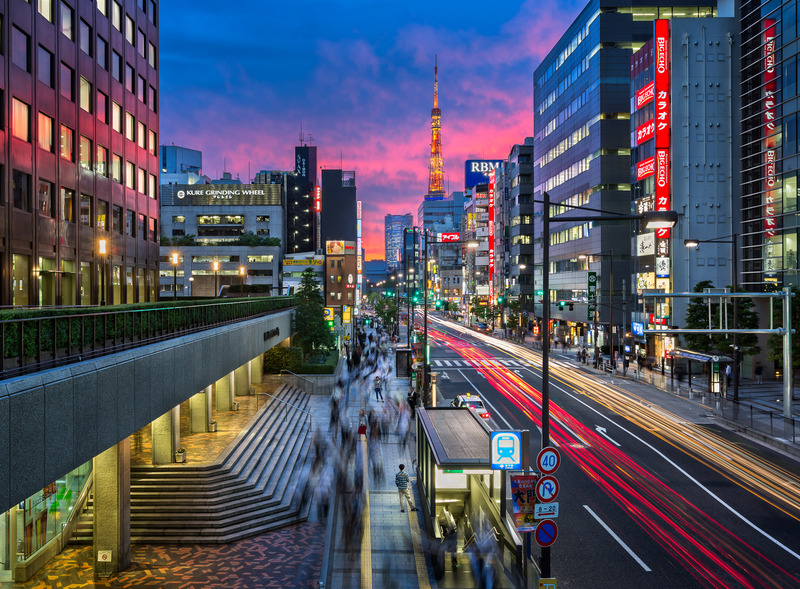 I climbed to the elevated pedestrian bridge over Shiba-Dai-Mon Street, and composed my frame in order to capture the vibrant traffic of cars and pedestrians alike. This is such a situation I accidentally shot, as I used the long shutter speed to keep a blurred feeling of the moving people and traffic, in order to convey the busy evening rush hour motion in Tokyo. However, 2 persons in the crowd did not move – a man and a woman – and they came out sharp and still in the moving crowd shot. This was the final touch for this incredible scene I envisioned.